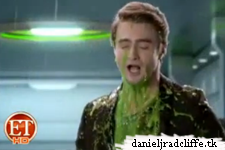 Daniel has been nominated for the 2012 Nickelodeon Kids' Choice Awards (Favorite Movie Actor for his work in Harry Potter and the Deathly Hallows part 2) He is also featured in the promo video together with host Will Smith and other nominees. The awards show take place in Los Angeles on 31st March 2012. The same day as the Grand opening of the Warner Bros Studio Tour London - The Making of Harry Potter in England. Please note that Dan has not been confirmed to attend either event, and he probably won't attend both, also since filming for Kill Your Darlings start in NYC on 19th March.